At Long Beach last weekend I heard lots of discussion about IndyCar's 2018 car. 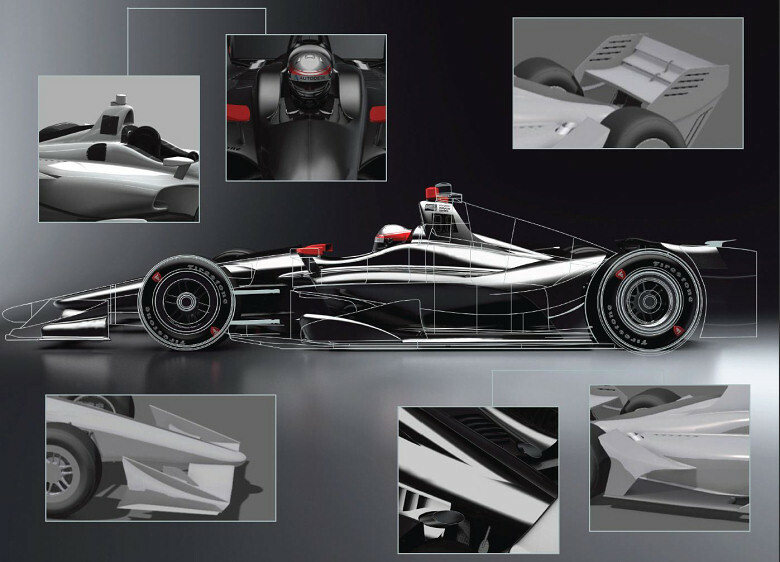 IndyCar's recently released renderings of the car suggest a much more aesthetically appealing machine and of course everyone is excited about the prospect of something new. 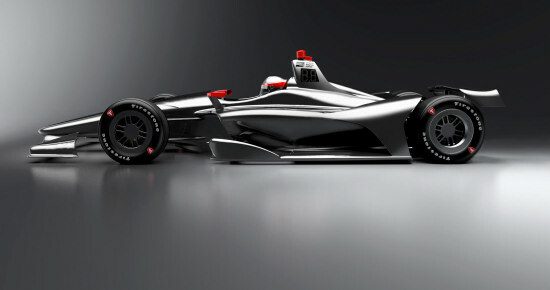 Although it's yet to be confirmed it's sure that Dallara will continue as IndyCar's car builder of choice. I'm among many people who would love to see somebody other than Dallara build the new car but the fact of the matter is Dallara is the only game in town. The likes of Lola, Reynard, March, Penske, Eagle and Swift are no longer with us, mostly victims of the CART/IRL war, and with IndyCar's current small TV ratings and tiny media footprint the teams can't attract the sponsorship to afford to pay for a war between competing car builders. With the demise of any serious competitors Dallara has enjoyed a well-managed rise to become the world's dominant production or spec car manufacturer. Today there's not another race car manufacturer outside Formula 1 with anything like Dallara's capabilities. So what do people think about the suggested 2018 car? Michael Andretti likes the aero concept of the 2018 car which reduces top side downforce in favor of making more downforce from the underside. Michael believes IndyCar is on the right track compared to Formula 1 which has allowed massive increases in topside downforce from the wings this year, making passing all but impossible. Michael's only complaint is that the reduced amount of bodywork surface means less opportunity to sell advertising space on the new cars. Michael's partner Bryan Herta is also a believer in the 2018 car. "I like it," said last year's Indy 500-winning entrant. "To me, it looks like an Indy car again. I think it's recognizable as an Indy car. I like the low engine cover. I think that's one of the things that made Indy cars distinctive compared to Formula 1 or any other type of open-wheel cars. "It will be interesting to see what the final design looks like. The best thing is people are excited about it. The fans and sponsors are very positive about it and that's good." Herta believes the key to IndyCar's future success is in attracting more engine manufacturers to compete in the series. "Five or six years ago it seemed like almost an impossible mountain to climb to get back to what Indy car racing once was," Bryan remarked. "I think a key part is getting more engine manufacturers. If we could get to four engine manufacturers it would bring enough money into the sport to make it work. "Nobody puts more money and more activation into the sport as a whole than the car manufacturers. With three or four manufacturers there would be enough money and support to pay for different chassis options. Maybe it could be a standard tub and you could do your own bodywork. "It has to be one or the other. It has to be either totally a spec car or it has to be totally open. You have to be able to develop the car. It's not good to have this kind of hybrid where you have two variations that are locked in because somebody is going to have an advantage. "That's the antithesis of what racing is all about. You can't tie one arm behind somebody's back for the whole year so there's nothing you can do to help yourself. Teams just want to have a chance to develop so if we're behind we can focus on making the car better." Bobby Rahal is also an enthusiastic believer in the 2018 car and looks forward to how things evolve over the next four or five years. "I think the new car looks good," Bobby said. "I'm looking forward to it. 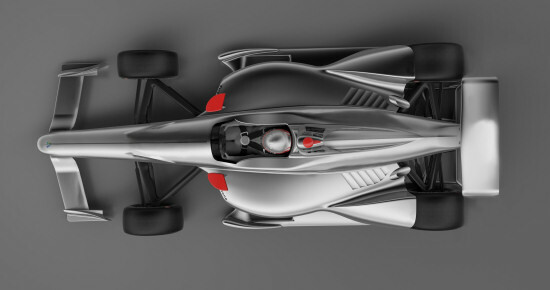 It will get back to the way an Indy car should look and I'm really looking forward to 2022 when there's going to be a new chassis and new gearbox. There are some areas on the current car which I think were badly done but I think we're getting there with the looks of the new car and I think the new aero package will improve the racing and make the cars more drivable than they are now. "I think Tino Belli is doing a great job and I give Jay Frye and his people a lot of credit. I think Jay is the best leader Indy car racing has enjoyed since the end of CART. He understands racing and there's give and take with him. He asks questions and listens. I'm enthused about the direction the whole thing is heading." Dale Coyne has no doubts a new car is necessary and laments the time and money spent on IndyCar's unsuccessful aero kit experiment. "I think the new car is a must," Coyne said. "I think the whole aero kit idea was a mistake. We all spent a lot of money on it when we should have spent that money to buy our way out of our TV contract. "We need to get bigger TV numbers so we can sell sponsorship and have the money to develop the car. If you have a one rating you're going to be able to attract sponsors but if you can pull a two you're going to be able to sell some serious sponsorship, which is what we all need. If we could start getting a one rating that would be a good thing but if we could get up into the two range it would be a home run. Every sport is down of course, but we've got to start doing better on TV." 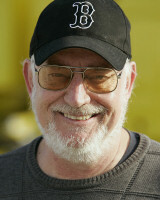 I also chatted with Jay Frye, IndyCar's director of competition and operations. Frye is the man behind the plan for the development of IndyCar's 2018 car and beyond and has quickly gained the respect of most people in the IndyCar paddock. "We wanted a creative plan that people could understand and wanted to be part of because having multiple OEMs is a key point in building the series," Frye emphasized. "We have announced that Chevrolet, Honda and Dallara have each agreed to extend their partnerships and that stability is very healthy. This is the beginning of the path and now we have to execute our plan. "The things you're hearing and reading about IndyCar these days seem to be positive," Frye added. "There are also some new teams like Juncos that want to get into the series and that's good." Frye pointed out that it's essential for IndyCar to work with the wider motor sport community. "It's important that the whole sport is healthy and as you know we've done a lot of things with ISC and SMI," he noted. "We're racing again at Phoenix and we've gone back to Watkins Glen. NASCAR are our friends and we're going to continue on that path." Frye said he believes it's important to study the past in order to get the best out of the future. "So much of the stuff we're doing in motor sport is not as if it's new," he remarked. "In many cases it's been done before by one sanctioning body or another. History is very important to me. How were things done at different times and why did they work or not? Sometimes there were pretty good ideas but they were tried at the wrong time. The more you can understand about that, the better. "I'm a twenty-five year NASCAR guy and I was always a fan of the sport. So I'm always asking questions. Why can't we do this or that? Why did they do this thing back in the old days? If you can understand why they did a certain thing in let's say 1994, then the better you can understand if it applies today." Frye says he enjoys great counsel from the likes of Roger Penske and Rick Hendrick. "I've been in the sport for half my life and it's a pleasure to be able to pick up the phone and call Roger Penske or Rick Hendrick," he said. "I've spent a lot of time around Rick. Guys like him and Roger are just incredible. I learned a lot from Rick by osmosis. The work and effort he and Roger have put in to build their businesses beyond racing has been just amazing and there are always lessons in the way they use motorsports as a building block for their other businesses." In closing, a few words from renowned safety equipment pioneer Bill Simpson, a truly independent soul and out-of-the-box thinker. Simpson offered a more radical view than any others of what he believes IndyCar should do with its car rules. "I started in drag racing and I believe in 'Run what you brung'," Simpson declared. "I think they should define a box and say the car has to fit in this box. You can do anything you like within that box. That would create different ideas and solutions and maybe produce four or five competitive car builders. That's what they need: fewer rules and more competition. They need to have the balls to do that. They've got to break the mould and create something different." Whatever the end result may be the long road to recreating IndyCar's identity and building a better future is beginning to take shape.